When Lee Jordan arrived at the ballfield that bears his name Monday night, he had an inkling the game would make headlines. "I just felt good about it," he said. If anyone knows about making headlines, it's Jordan. He's the man who set the type for the now-iconic six-inch-tall banner headline for the June 30, 1958, issue of the Anchorage Daily Times announcing Alaska statehood. 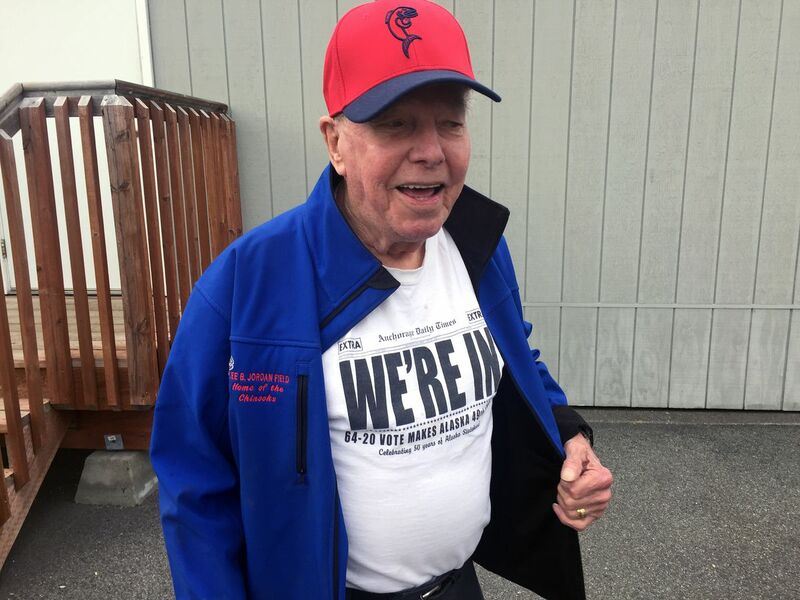 He's also the president of the Chugiak-Eagle River Chinooks booster club, and on Monday, he wore a T-shirt bearing the famous headline for the winner-take-all Alaska Baseball League game between the Chinooks and the Anchorage Glacier Pilots at Lee Jordan Field in Chugiak. "WE'RE IN" reads the headline. After nine innings of play, Jordan's Chinooks were in too. By beating the Pilots 5-4, Chugiak claimed the final spot in the ABL playoffs that begin Wednesday. The top-seeded Mat-Su Miners will host the fourth-seeded Chinooks and the second-seeded Anchorage Bucs will host the third-seeded Peninsula Oilers in a pair of three-game series. The winner of each will advance to the championship series beginning Aug. 4. While the Miners are the two-time defending champions, the Chinooks are newcomers to the ABL playoffs. The team is sponsored by the Athletes in Action nonprofit Christian fellowship organization. Ever since settling in Chugiak in 2012, the team's booster club president has been Jordan, a community booster who in 1971 founded the Chugiak-Eagle River Star newspaper with his wife Barbara. A standing-room-only crowd watched Monday as the Chinooks held off the Pilots to secure its playoff berth. Centerfielder Anthony Forte went 3-for-4 with a pair of RBIs and the Chugiak bullpen protected a 5-4 lead after started Bryan Pope left after five innings. Forte was among 18 players named to earn first-team honors on the all-ABL team announced Tuesday. Jake Vieth of the Bucs was named the Player of the Year. A left-handed first baseman from Gonzaga, Vieth batted a league-leading .364 with 33 RBIs and six home runs in 38 games. Getting the nod as the league's top prospect was Mat-Su relief pitcher Bryce Tassin. Tassin, a right-hander from Southeast Louisiana, struck out 26, walked seven and yielded seven earned runs in 22 innings this summer. Relief pitchers — Bryce Tassin, Miners; Kyle Wullenweber, Bucs; Nathan Bock, Miners.